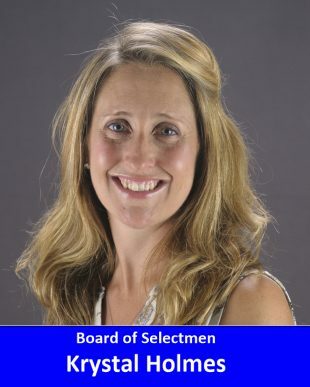 Experience and Qualifications: I have actively served on the Board of Selectman for 1 term. It has been an honor to serve the residents of Suffield and represent their voice, opinions and thoughts on the board. My two-year term has gone by quickly and I would like to continue the work we have begun because there is still much to be done. Professionally I have been a real estate agent at Chestnut Oak Associates for nearly 15 years. I pride myself in my strong drive and work ethic and commitment to our beautiful town. Education: I have a bachelor of science degree in business and communications from Western New England University. I also participate yearly in continuing education for real estate, to stay on top of current trends and laws for my clients. Family: I am a proud, life-long resident of Suffield. My husband Dan and I have two wonderful children, Dylan, 10 and Addison, 8 who attend school in Suffield and are having the same magical childhood I had in this great town. Community Involvement: I have a deep passion for volunteering and helping others and have held numerous leadership roles within the community. I was chairperson of Relay for Life, the Suffield Cooperative Preschool and the Bridge Street Community Center project. I am also a regular volunteer for the Emergency Aid Association, PMC Kids Ride and at our public schools. All of these experiences have shaped the individual I am and have allowed me to become a good communicator, listener and an individual who looks outside the box for solutions. I have always been a “doer,” someone who is quick to volunteer and help in any way I can and I look forward to continuing to serve our community in this same way. It has been a privilege to serve the residents of Suffield for the past 2 years. I take the responsibility very seriously and am a regular participant at all meetings. I am a critical thinker who asks questions, researches topics and listens to other opinions. During my current term, I have made it a priority to always talk with residents to seek their opinions and thoughts on topics so their input and feedback is represented in all board conversations. I will continue to serve in the same way because I believe open, transparent government is mandatory. I would like to see continued progress on all our large capital projects. I would like to see more efficiencies found in how the town does business so we can perform to our highest potential and reduce costs. An effort needed during this difficult financial time in our state. I would like to see continued economic growth through diverse development opportunities i.e. commercial, agricultural, light industrial, retail and residential within our Town Center and throughout the Town. I would like to see our community research the concept of a Town Manager form of government, to allow for maximum continuity, accountability and greater success in long term planning. I would be honored if you would give me the opportunity to serve for another two years to continue being a positive, critically thinking and open-minded voice on the board. I appreciate your support and encourage you to vote on November 7th. Bielonko, Stiles and Lefcheck farms preserved, Town purchased all development rights. Approval of many grants including FEMA grant for firefighters, Local Transportation Capital Improvement Program (LOTCIP) for multi-use path on Mountain Rd., Historic Preservation Grant, Main Street Investment grant for BSCC, to name a few. Tax abatement program for agricultural tax payers which was created as an incentive for the Hydroponic Tomato farm and a Town Center Tax Increment Financing (TIF) District to help encourage commercial growth. Installation of Fiber Optic line from Town Hall to Senior center using some grant funds. Approval of contract with Lodestar for a net metering agreement, using energy from solar farms, which provides considerably savings on our top 10 electric accounts. Approval of a new Stop Loss Insurance program, saving the town money. Numerous appointments of well qualified residents to boards and commissions.